I'd like to order a case but my phone is not on your list of supported handsets. We regularly update our list of handsets that we support. If yours is not on there, please contact us via our Feedback Page and we will see what we can do! Can I buy cases for other people? Yes. You can have numerous cases / trackers added to your account. We recommend that you restrict third party cases to members of your household as the contact details can only be edited within your login. If somebody finds my mobile, aren't they simply going to keep it? That is many people's perception but in actual fact, many mobile phones sit waiting to be collected in lost properties because they, or any finder for that matter, don't have a means of contacting the owner. Especially if the screen lock is activated or the battery is dead, for example. 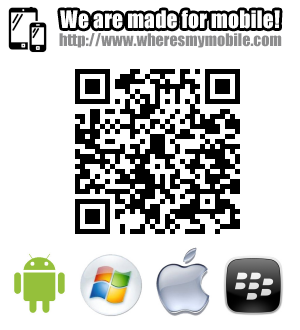 Does a finder need to be registered with wheresmymobile.com to contact me if they find my mobile? No, anyone can contact the owner of a lost mobile without the need to register or log in. If someone finds my phone through wheresmymobile.com, do they get a reward? Opinion is split over whether someone should be rewarded to do what is arguably the right thing anyway. So we leave it to the registered user to offer a reward if they wish and put details in the message field on their contact profile if that is the case. How can I guarantee I will get my mobile back by registering a wheresmymobile.com case? We can make no guarantees that you will retrieve your mobile. However, for the same cost or cheaper as many other mobile phone cases, you can increase the chances with one of ours. I don't want any contact details disclosed via my tracker. Can I still use your service? That is no problem. You can choose exactly what information you wish to disclose and if that happens to be no details at all, then a finder can always send a message to us which we auto-forward on to you by email. If my contact details change, do I need to buy a new case? No! The tracker on your case does not need to change - only your contact details that it links to which can be updated online at any time. What happens to my tracker if I buy a new mobile phone? Simply buy a new case for the new mobile and create contact details for its tracker. Of course, if the new handset is the same, the existing case can be put on the new mobile. If you have a question that is not answered here, please contact us. We welcome your enquiries and feedback.